The MEET.ONE Sidechain launched on the 27 February 2019. 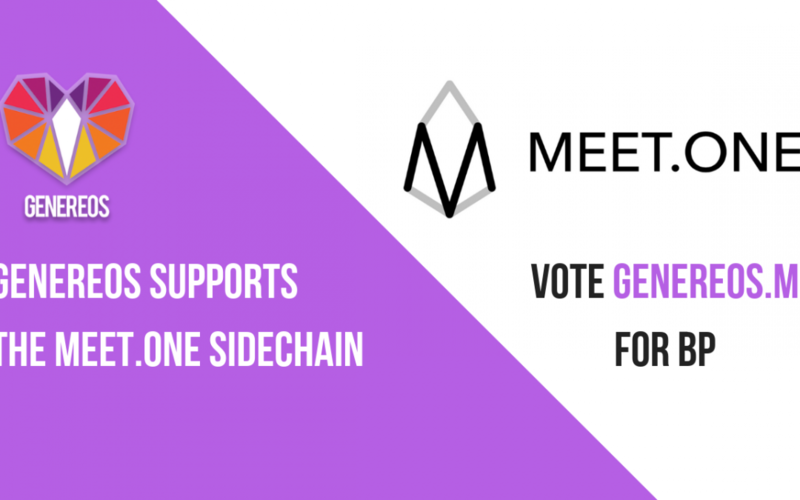 Team GenerEOS is excited to announce their support for the MEET.ONE Sidechain. Along with a solid support network. GenerEOS is in the running to be an active Block Producer on the MEET.ONE Network. We have always loved this community and the support that our followers have given us. Currently we actively produce blocks on the MEET.ONE Sidechain. Be sure to support us by voting for us here: https://meetone.eosx.io/tools/vote/ (Please note you will need to set up a MEET.ONE account first, there is a video tutorial below). GenerEOS has been a Go-Live Block Producer candidate on the EOS mainnet since June 2018 as well as an Active Block Producer on the Worbli Sisterchain from day one. . We participated in the mainnet testnets and have continued to pursue excellence within the EOS network. Our primarily mission is a social enterprise block producer whose purpose is to promote and support scalable and extremely reliable block production whilst giving back block rewards to charities. Furthermore, GenerEOS also actively contributes in BP discussion, engage and garner community exposure for dApps and upcoming projects as well as meet-ups and events. GenerEOS has demonstrated security & efficiency by completion of the first online wallet aka the EOSToolkit.io. The EOSToolkit continues to evolve for the EOS community and assistance is only a click away. GenerEOS is excited to be a part of the MEET.ONE Network and looks forward to producing blocks as well as supporting up and coming dapps on the sidechain. What is the Meet.One Side chain? For some information the MEET.ONE Sidechain you can check out Tom’s video about what a sidechain is and what the MEET.ONE sidechain is about. The MEET.ONE Sidechain airdrop will be based on a snapshot of your EOS Mainnet account taken on the 19 Feb 2019. MEET.ONE Tokens will be dropped at a ration of 2EOS:1MEET.ONE. Please see the video tutorials below to claim your MEET.ONE Sidechain airgrabs before the 7 March 2019. Here is a brief video tutorial that runs through how to transfer your MEET.ONE Tokens from your EOS Mainnet account to your MEET.ONE Sidechain account. Here is a step by step video tutorial on how to vote for your favorite Block Producers on the MEET.ONE Sidechain.